Bangor High School lacrosse coach Mike Keim (center) instructs his team including Jonny Lyons (2) and Jacob Henry during Wednesday's practice in Bangor. The Rams are gearing up for their first season of varsity lacrosse this spring. Makayla Hughes of Bangor High School prepares to make a pass to a teammate during their girls varsity lacrosse practice at Red Barry Gym in Bangor on Wednesday night. Maddy Boudreau looks on. 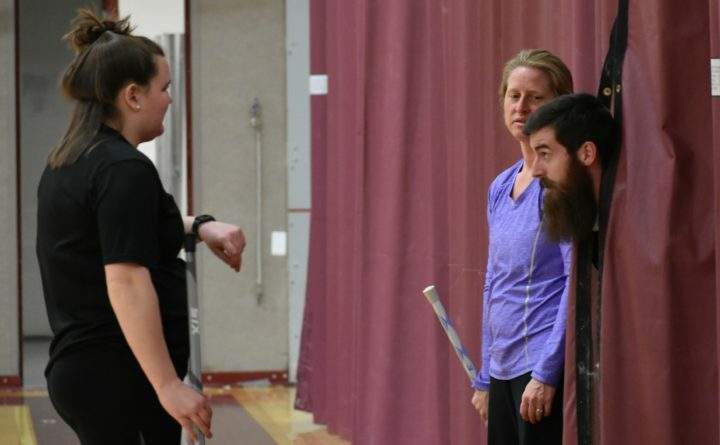 Bangor High School boys lacrosse head coach Mike Keim (right) peeks out between the curtains to speak with Rams girls lacrosse head coach Kaitlin Dolloff and girls assistant Karla Thayer during Wednesday night's practice at Red Barry Gym. Bangor is fielding varsity lacrosse teams for the first time this spring. Bangor High School lacrosse player Brielle Biehn prepares to receive a pass under the watchful eye of head coach Kaitlin Dolloff during a recent practice at Red Barry Gym. Bangor is fielding a varsity team for the first time this spring. Bangor girls lacrosse coach Kaitlin Dolloff (left) defends against Rams player Kate Ruhlin amidst a shooting drill during Wednesday's practice at Red Barry Gym. Bangor is a first-year varsity program this season. Nason Vassiliev (second right) talks with teammates (from left) Griffin Erb, Reid Higgs and Jacob Henry (right) during practice for the Bangor High School boys lacrosse team on Wednesday night's practice in Bangor. The Rams are preparing for their first varsity season. 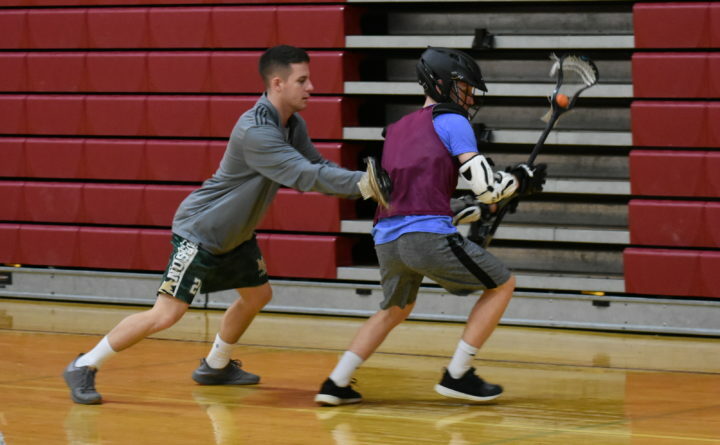 Assistant coach Marc Roy provides some token defensive pressure against Reid Higgs during a drill at Bangor High School. BANGOR, Maine — Neither Nason Vassiliev nor Nicole Eudy minded having a late practice on a recent evening. They’ve been awaiting the opportunity for years. 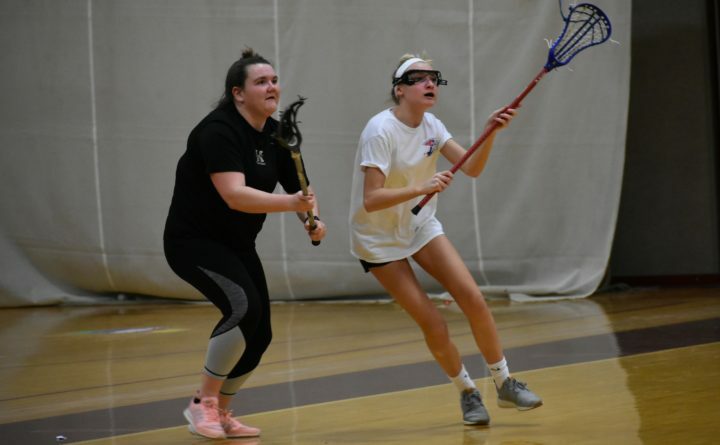 Vassiliev and Eudy represent the latest step in Maine interscholastic lacrosse’s northern expansion, with Vassiliev a member of Bangor High School’s first-year boys varsity team and Eudy the lone senior on the Rams’ inaugural girls varsity squad. The two players, like many of their nearly 50 compatriots, have several years of club lacrosse experience. But the opportunity to represent their school in varsity competition — with a full 12-match regular-season schedule leading to playoffs and the potential to win a state championship — is for them the ultimate sign of credibility for their sport. Other schools are adding lacrosse to their varsity sports offerings. A cooperative boys team representing Nokomis Regional High School of Newport and Maine Central Institute of Pittsfield made its varsity debut last spring and was then the state’s northernmost team. John Bapst Memorial High School of Bangor is adding a boys varsity squad this year. The Crusaders and Bangor High will play twice during the regular season, April 27 at Husson University and May 19 at the Union Street Complex. 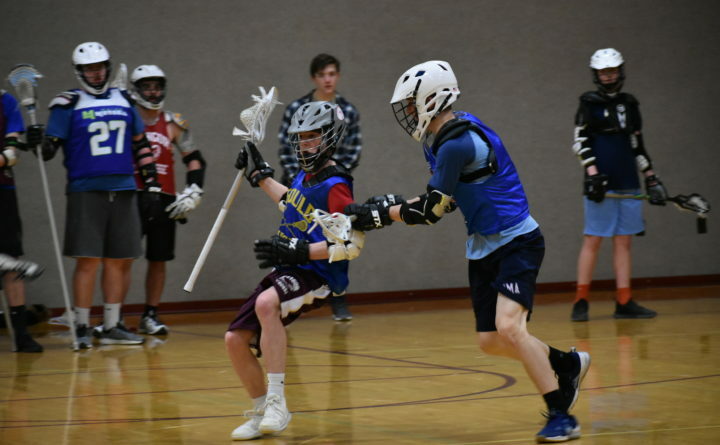 “We had a club team last year so we had a bunch of kids who had played through Eastern Maine Youth Lacrosse over the last several years and then we had a club team through them last year and it went pretty well,” said John Bapst athletic director Dan O’Connell. The Crusaders have approximately 25 players working out under coach Drew McLaren, a University of Maine at Farmington club lacrosse player who most recently was an assistant coach at Washington University of St. Louis, Missouri, before returning to Maine with his family. O’Connell said early indications are that the John Bapst lacrosse program isn’t taking athletes away from the school’s other spring sports teams. 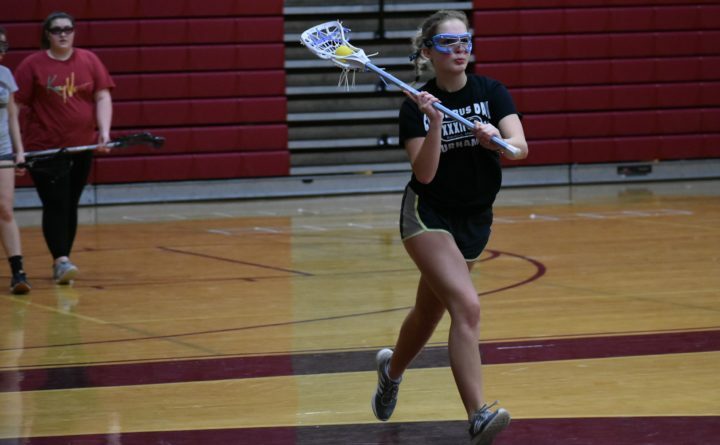 The addition of lacrosse at John Bapst and Bangor brings statewide totals to 46 varsity girls teams and 46 varsity boys teams, which are divided by the MPA into Class A North and South and statewide Class B and Class C divisions by enrollment. 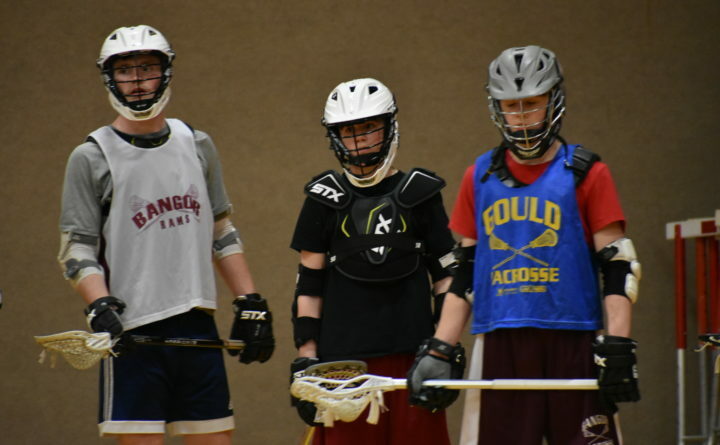 Bangor’s teams are in Class A North while the John Bapst boys compete in Class C.
Other schools in the region have discussed adding lacrosse including Brewer, which is fielding a boys club team for the first time this spring. 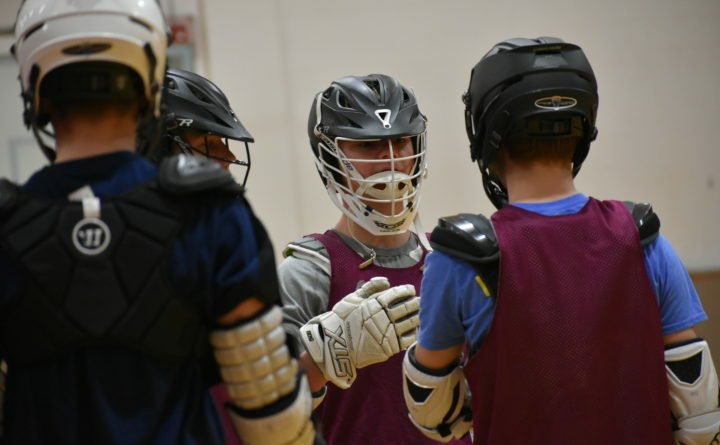 The steady increase in Maine high school lacrosse programs — the sport was introduced by the MPA in 1998 with 23 boys teams and 15 girls squads — corresponds to nationwide enthusiasm. According to an annual report produced by US Lacrosse, overall national participation in the sport grew 3 percent in 2016 to 826,023, marking the 12th consecutive year that participation increased by at least 20,000. Also in 2016, the number of youth players topped 450,000 for the first time, with the report adding that lacrosse continued to be the fastest-growing team sport at the high school and collegiate levels. From 2011-2016, the number of schools sponsoring high school lacrosse had risen 27 percent. In Maine, 1,814 boys and 1,419 girls played high school lacrosse in 2017, according to statistics from the National Federation of State High School Associations. Michael Keim coaches the Bangor boys lacrosse team and the University of Maine men’s club team and also is involved with Eastern Maine Youth Lacrosse. He thinks the trend will accelerate in eastern Maine. 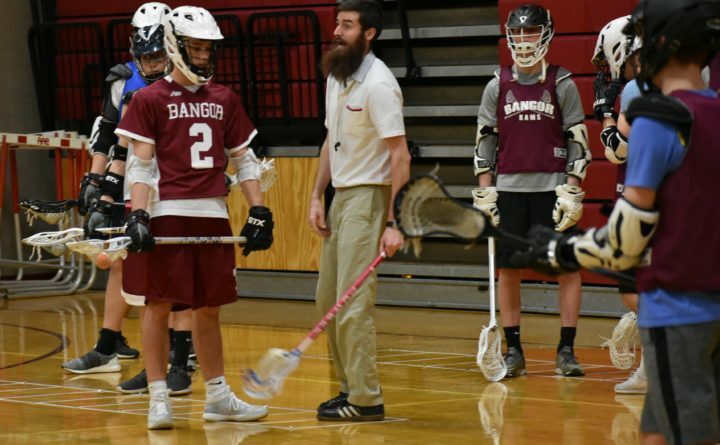 Keim, who has coached Bangor High club teams since the 2014-2015 season, said news last year that the school was adding lacrosse as a varsity sport quickly increased the number of participants. “A quarter to almost half of the kids here are new and that’s very exciting,” said Keim of the turnout at tryouts. “Now we want to show the state of Maine what Bangor lacrosse is all about,” he added. Bangor girls lacrosse coach Kaitlin Dolloff, a four-year lacrosse and field hockey goalkeeper at Husson University in Bangor, was equally enthused about the turnout for her squad, which initially numbered 23. 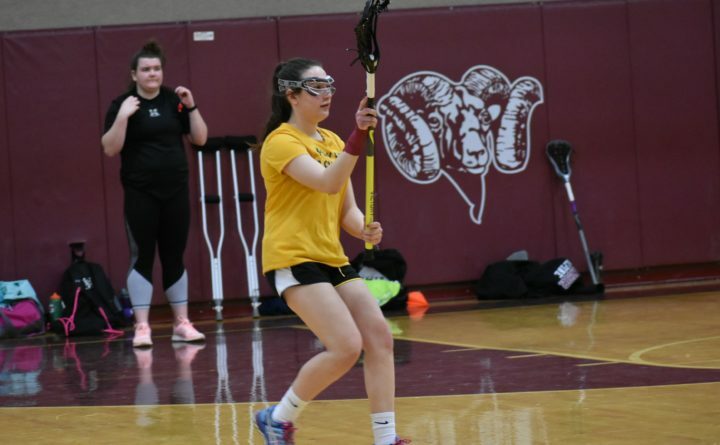 “I think we sense that with the girls across the board, from the seniors through to the freshmen, that they’re very excited to be the first Bangor varsity lacrosse players,” she said. There is a pride factor in bringing a varsity sport to a school, but there’s also an understanding of the challenges ahead as the new squads prepare to compete against established opponents. The Bangor boys play their first varsity match at home against Lewiston on April 12 with the Rams’ girls squad debuting with a home match against Erskine Academy of South China on April 13. “We have to go into this with intensity, so we’ve added a lot of competitive elements to our practices to let the girls know it’s not going to be a walk in the park,” said Dolloff.